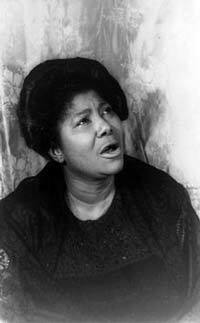 Mahalia Jackson was a gospel singer from the United States. She won the title “The Queen of Gospel” for her remarkable contralto voice. She was also heavily involved in the Civil Rights Movement. Harry Belafonte once stated that she was the most powerful African American woman in the country. Jackson spent most of her recording career with Columbia Records, with whom she recorded many albums and sold a lot of singles. Jackson was born in New Orleans on October 26th, 1911. As an infant, she had such severely bowed legs that her aunt – who helped to raise her – was advised to take her to surgery. This would have involved the child having her legs broken before being reset, something which her aunt refused to do. When she was five, Mahalia’s mother died, after which her aunt became her full guardian, with her brothers and cousins also coming under her protection. As a youngster, Jackson was already an enthusiastic singer, although her busy home life meant that she only really had time to sing while she was at church. After receiving baptism in the Mississippi River, Jackson began to sing seriously at the Baptist church at Mount Mariah. By the time she was 16, she had accepted an invitation to become part of the choir at Greater Salem, and in 1929 she met Thomas A. Dorley, the composer dubbed “The Father of Gospel.” A few years later, the two entered a relationship that would last for 14 years, during which she made a number of tours to sing Dorley’s music. Jackson married in 1936, but her husband suffered from a gambling addiction and she divorced him in 1941. She had also been unhappy with his desire for her to sing secular as well as religious music because he said it would make her more money. She had recorded a few records for Decca Coral in 1937, but – perhaps as a consequence of her marriage – they were not of a high standard and the label released her. After WWII, she signed to Apollo Records and started to experience significant commercial success, with album sales reaching more than eight million. During the late 1940’s and early 1950’s, Jackson had a string of hits, and in 1950 she appeared at Carnegie Hall, the first gospel singer to achieve that honor. By the time she toured Europe in 1952, she was widely considered the finest gospel singer in the world. Two years later she signed a new Columbia contract and starred in a CBS radio series. By now firmly established in the top tier of international stardom, her 1960’s appearances included the inauguration of President Kennedy in 1960 and the funeral of Dr. Martin Luther King Jr. in 1968. Despite her advancing years, Jackson continued to maintain a busy schedule of touring and performances. She toured Europe, India and Japan. The Liberian president also asked for a special appearance, a request she granted. Her final public concert was in Germany in 1971. When she had finished, she returned to her home in Chicago. There, she put some of her earnings from music into a beauty salon and flower shop. However, this new career was short-lived. In January 1972, she died due to heart failure, with complications brought on by diabetes.